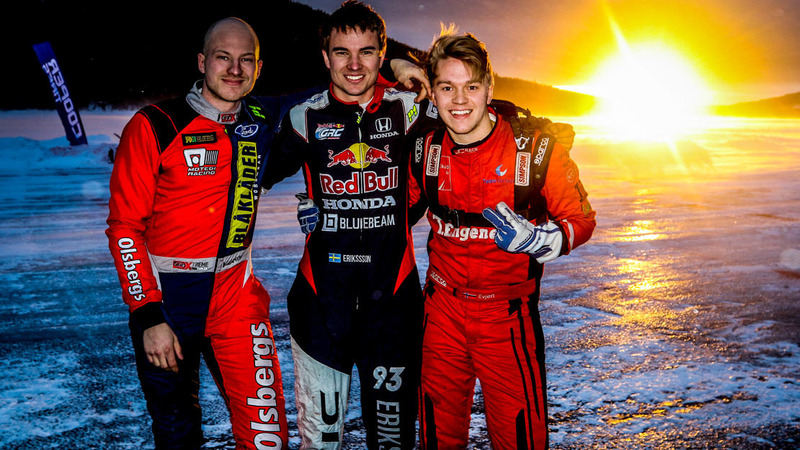 An Eriksson standing on top of the podium at RallyX on Ice presented by Cooper Tires has become a common sight in recent years – with defending champion Oliver and former title-winner Kevin both reaching the highest step last year – but today, it was the turn of Sebastian Eriksson to triumph, as he made his return to the series he dominated back in 2015. The 2019 edition of RallyX on Ice revved into life in dramatic fashion today (18 March), as strong winds made for tricky conditions on Sweden’s frozen Lake Åre. Famously understated, Sebastian Eriksson had flown somewhat under the radar in the build-up to the week, but his recent success in the SM Veckan Swedish Winter Championship hinted that he should not be ruled out – and he went on to prove that point in some style. One of the few drivers not to make any major mistakes on a day that saw many a trip into a snow bank, the 26-year-old was consistently quick throughout the qualifying stages and converted a rocket-propelled getaway from the second row of the grid in his semi-final into a lead he would not subsequently relinquish. Similarly leaping off the line in the all-important final – this time from pole position – Eriksson again controlled proceedings to perfection to land the first blow in the chase for the 2019 RallyX on Ice crown. After picking up the pace throughout the day, Norway’s Sondre Evjen made the most of an early joker to win his semi-final, and he used the same tactic to good effect in the final, leapfrogging Pontus Tidemand and Kevin Eriksson before going on to push Sebastian Eriksson all the way to the chequered flag for a well-deserved second-place finish. Kevin Eriksson rounded out the rostrum in third, and the World RX race-winner’s fluctuating fortunes somewhat mirrored the overall rhythm of the day. Having twice collided with a snow bank in his semi-final – on the second occasion when trying to wrest the last final spot from Ole Henry Steinsholt – it looked like the Swede’s day was done, only for a problem on the start-line for the luckless Petter Leirhol to grant him a get-out-of-jail-free card. He did not waste it. Steinsholt came home an impressive fourth in only his second career Supercar Lites start – the Norwegian demonstrating his versatility throughout the day by switching seamlessly between cars as he similarly competed in the supporting CrossCar category – with Tidemand ultimately placing fifth following a real rollercoaster ride. Fast from the outset, the former Junior WRC and WRC2 Champion – who contested a part-season in the FIA World Rallycross Championship in 2014 – had to serve two joker laps for a jump-start in Q2, but such was his astonishing turn-of-speed, he still topped the timesheets by almost three seconds. Rapidly marking himself out as one of the favourites for glory, the Swede flew off the line when the lights went out in the semi-final but just as swiftly flew into a snow bank on the outside of Turn One, bringing out the red flags. Ultimately finishing second in the re-started race, he then skated off-piste again in the final and had to settle for an eventual fifth place. Fredrik Damm Larsen failed to finish the final but was another to turn heads with an eye-catching performance first time out in Supercar Lites, while a number of drivers had hard luck stories to tell. American teenager Cole Keatts commanded his Q1 race and confidently led the second semi-final until coming unstuck against a snow bank, while OMSE team-mate and defending champion Oliver Eriksson’s challenge was curtailed by an uncharacteristic error midway through the first semi-final, having won both of his qualifiers to top the intermediate standings. Leirhol was one of the stars of the show and was unfortunate not to have the chance to fight for victory in the final, and there were flashes of form, too, from World RX regular Oliver Bennett, former RallyX on Ice runner-up Alexander Westlund and JC Raceteknik’s Ben-Philip Gundersen. In CrossCar, Yellow Squad’s Julle Ljungdahl proved unbeatable in the qualifying races, but will have to wait until Wednesday to try to convert that superiority into silverware after the semi-finals and final had to be postponed due to the worsening weather. The 2019 RallyX on Ice presented by Cooper Tires festival will comprise three events held over six days. Each round will feature a different track layout – including a high-speed oval – with fans encouraged to enjoy the high-quality racing amongst the excellent local facilities on offer.